What do those folk at Michelin look for when they're dishing out the stars? It used to be stuffy dining rooms, starched linen and spotlit table settings. Perhaps a French waiter would sweep past to correct your napkin placement, and to hold a chair out for you when you return from the bathroom. Lobster, foie gras and truffles were the classic tick! tick! tick! of a menu that was aiming high, with a price to match it. I went to The Clove Club mere days before they were awarded one, for a triple whammy family celebration. Happily there was no fussiness, and, given the high ceilings, I was surprised by how quiet the main dining room was, since most of the tables were taken. Clever acoustics. An open, turquoise-tiled and gleaming kitchen showed off the chefs gliding silently around each other at work. There are two options to the menu - a £55 course set, or an extensive £95 number. We decided on the former, declining the £11 addition of the pork chop. That decision was two-fold - supplements on a set menu is a bug bear of mine, and we weren't sure we could hack it. My new age is letting me down. A few snacks arrived to kick off the meal. Wood pigeon sausage with greengage jam came skewered on toothpicks, while tiny little crisp tartlets, incredibly delicate, filled with goats curd and a disc of beetroot rested on a folded napkin. 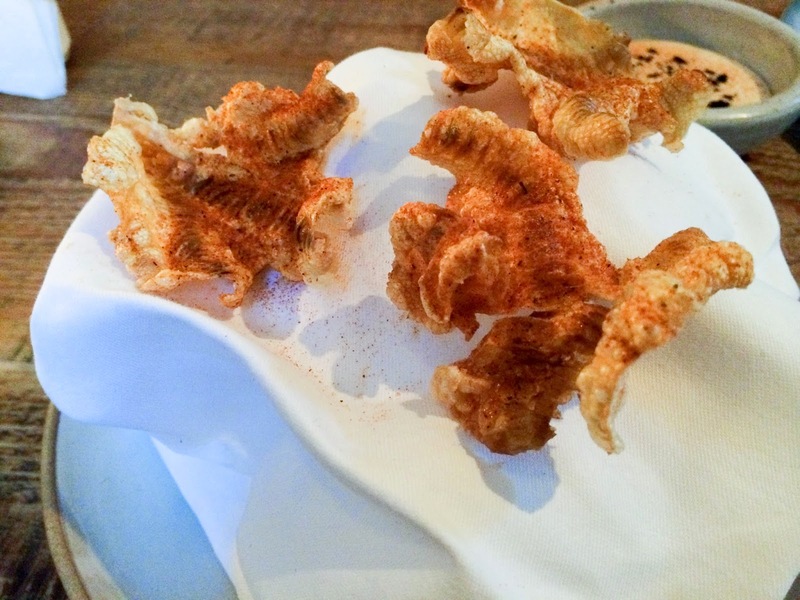 Chickens' feet, deboned and puffed until crisp and dusted with spice (top pic) came with ample dip, a creamy sort. Their famous buttermilk fried chicken that I first tried in 2011 was as good as its always been, and even better dunked in the aforementioned dip. Confusingly, the house-cured coppa arrived after our snacks, rather than with our aperitifs. But, no matter. 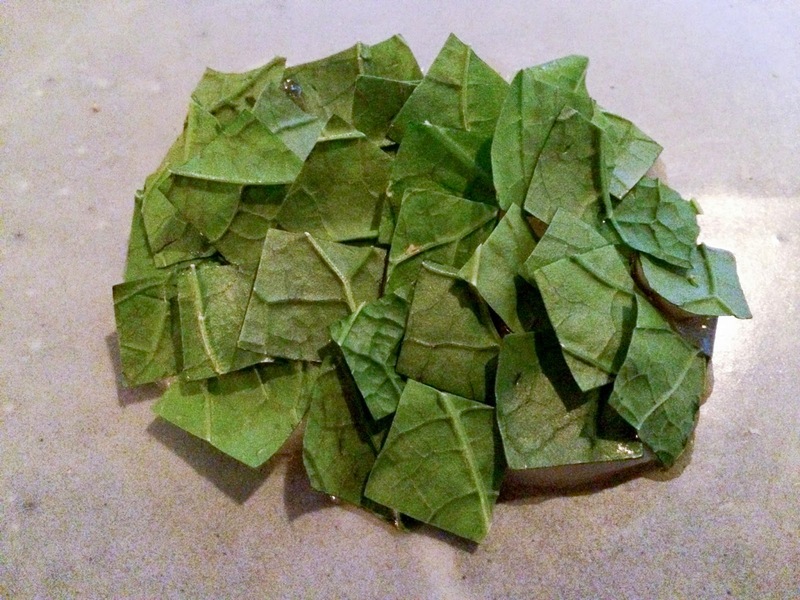 Beneath the mass of perfectly square mustard leaves was raw scallop topped with brown butter jelly. The dish played clever tricks on the tongue; the rich flavour of butter was in a clear jelly, while the clean, fresh sweetness lay in the creamy discs. I swiped the plate clean with dense, malty sourdough. The fish course was perhaps the least memorable, which was in part due to what followed. 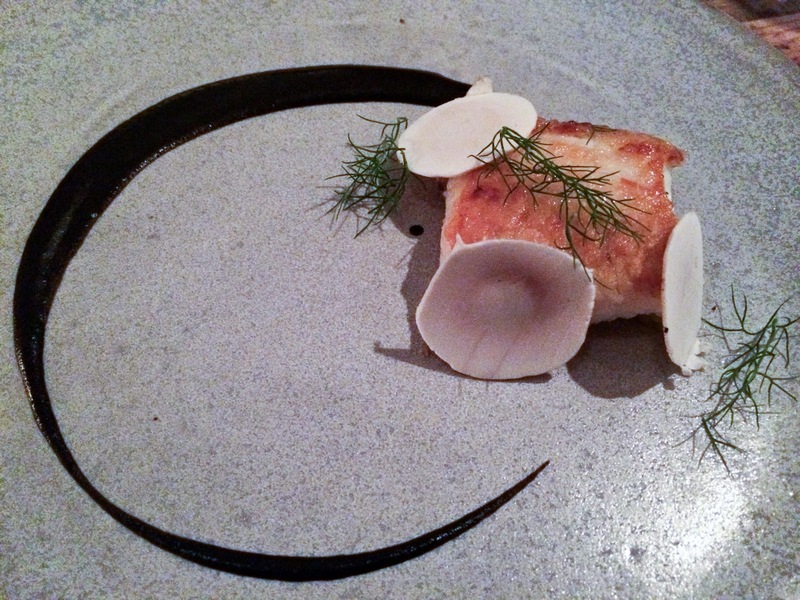 Still, the square of brill we had was heightened by raw shaved ceps and a swoop of inky truffle-scented sauce which, by the time I was done with it, stained the plate to look like a child's fury at art class. It's not that it wasn't good. It was just that the next course was such a highlight. We were presented with a wine glass in which 100 year old Madeira was poured into it and we were invited to sniff it. Slightly nervous-making for my mother who is, incredibly unfortunately, allergic to booze - the face reddens, the room wobbles, the vision swims, unpleasant things happen and an instant hangover sets it. I am beyond glad I did not inherit this. But our waiter pleasantly remembered her avoidance of our delicious, delicious wine and a small half measure was administered for her, and a serving of hot, clear liquid was poured into each glass. It was a broth made with duck, and if wasn't the best damn thing I've drank for a while then I don't know what is. Creamy on the tongue, sweet from the Madeira and slightly herbal in fragrance, it made you lick your lips and go back for more. I was genuinely upset it had finished. Mother survived intact. 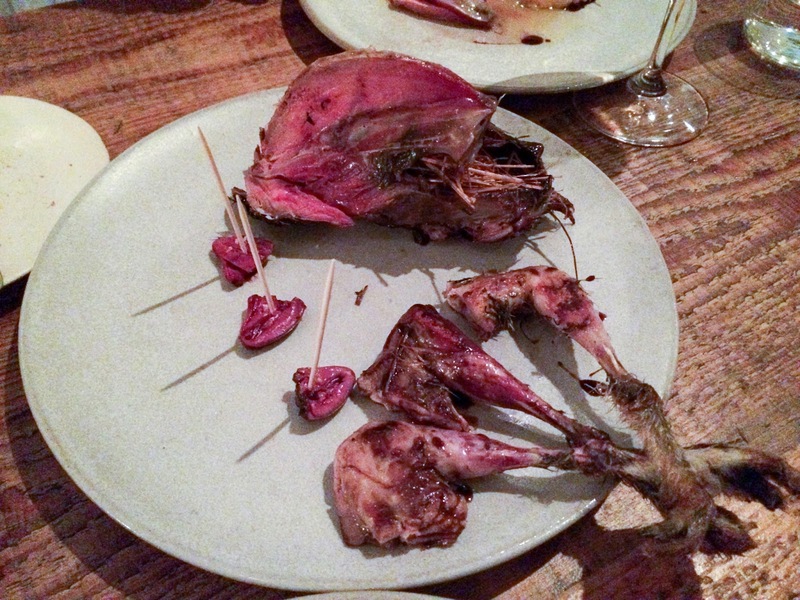 Our next course was another milestone of mine; usually, I am a grouse-avoider. I just couldn't get on board with those gamey little birds, all smelling of heather and moorland, but this year has been a bit of a turning point - perhaps my tastebuds have changed? Starting off with Tim Anderson's (of Masterchef fame) grouse ramen, it no longer makes me wrinkle my nose in distaste. I suppose if anything were to change my mind it would be a bowl of noodles. The Clove Club's was a more traditional serving. The breast, taken off the bone was served with swede puree and bread sauce. I'm not sure how they did it, but the skin was roasted and crisp, the flesh beneath yielding and uniformly pink. The carcass was presented for us to nibble and gnaw on, with little lollipop legs (which had disarmingly furry claws) of darker, more flavoursome meat. The tiny little heart, vivid and bloody, skewered on a toothpick was tender and sweet. After such a rich and flavoursome meat course, the Amalfi lemonade with black pepper ice cream was positively cleansing. A small glass of of beautiful, creamy foam was given to us, and hidden within was a quenelle of ice cream, so what you had was a slight fizziness from the lemonade, followed by the spiciness of pepper. It was incredibly clever. 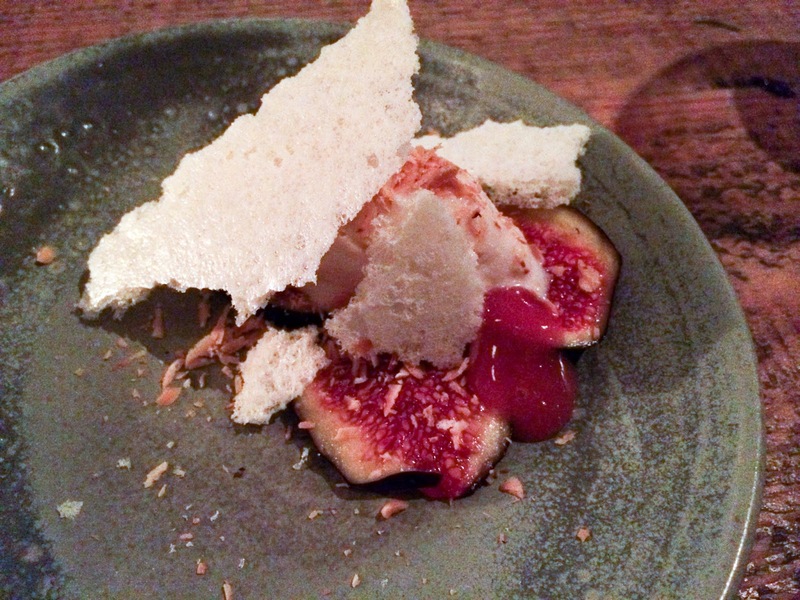 Figs with hazelnuts and milk crisps were a plate of contrasting textures, ripe fruit and autumnal warmth in flavour. Service was discrete when we were in deep conversation, but open and friendly when we were distracted. Being moved to our table from the bar mid-drink, and the coppa served after the snacks made me a little more aware that I usually am of the table being booked out for a second sitting, and though the dishes came out in quick succession, I soon lost the feeling of being rushed. If you're after a long and languishing meal though, booking later in the evening seems best. The Clove Club was one of the best meals I've had so far this year; it eased me into the autumn and winter season gently with plenty of rich, earthy flavours, executed elegantly. I don't mourn the hot stickiness of summer anymore - bring on rich game, slow-cooked stews, and - most importantly - hot booze. I'm ready. HOT HOT BOOZE. Let's do it. You know it's inevitable, we should just embrace it. Oh God I want to go back here so much. The duck soup sounds amazing. It was really brilliant. Go, before they take it off the menu!